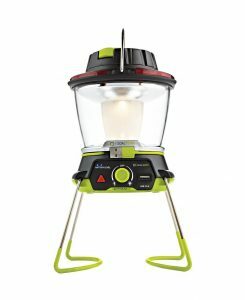 Is getting a camping lantern included on your to-do list? It should be! Camping lanterns make life a lot easier and it allows the fun of camping, stargazing, and barbecue to continue all night through. Even if you aren't that fond of outdoor activities, a camping lantern is still a must-have for your home. You'll never know when a cyclone would knock out your electricity. Flashlights are good, but when it comes to efficiency, they are not the best. Camping lanterns provide a reliable power source to illuminate your way anytime, anywhere. What is more, some come with handy features such as a USB port for your mobile phone. With so many camping lanterns available varying from hand-cranked to solar-powered units, it can be too overwhelming to choose one among hundreds. Hence, this article will throw some light on the buying mystery! We narrowed down six of the best camping lanterns on the market and listed each product's important features so you can skip the guesswork and bag the perfect one! But first, see what factors you need to keep in mind. 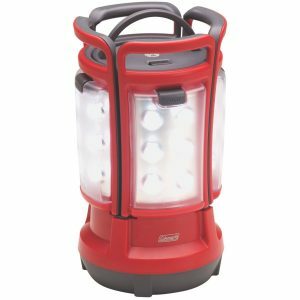 If you are looking for a camping lantern to light up your path in the woods or illuminate your home during a blackout, the Coleman Quad LED Lantern Special Edition would surely not disappoint. This unit has cool unique features and hence it is no surprise it’s a best-seller. The Coleman Quad consists of four detachable LED panels, each consisting six 5mm LED lights. During a blackout, your kids can snap off each panel like a banana so they can have their own flashlight. Each panel can light up for one hour and 30 minutes. If the lights are fading, you can put it back in the lantern base to charge. 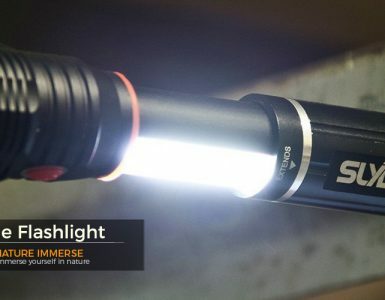 Altogether, the lantern glows at 190 lumens for up to 75 straight hours. The base has its own light so it keeps glowing even if everyone has taken all the panels. What is more, the lantern will always remain cool and hence it is safe to leave it unattended even around kids. Moreover, the Coleman Quad is powered exclusively using eight D-cell batteries, which you need to buy separately. Goal Zero’s brightest camping lantern, the Lighthouse shines at 400 lumens and you can choose between a 180-degree setting or a full 360. With both sides lit at a high setting, it runs a maximum of six hours but a dimmed down 180-degree setting can light up till the crack of dawn. In addition, we like how Lighthouse features a frosted LED cover that adds a soft touch to its lighting. Just like most rechargeable LED camping lanterns, the Lighthouse’s operation is straightforward. Simply plug its USB cord into any power source when it needs to charge. Once it reaches a full charge, all four of its light indicators will turn blue and from there will go down to three, two, and one as it loses its juice. You can also use its USB port to charge your smart devices. Albeit a little old-school for the millennial camper, experienced campers know that there are reasons why you shouldn’t abandon fueled lanterns just yet. The Coleman Premium Dual Fuel is the best option if you need something really bright and can provide years of service. This camping lantern is designed to withstand extreme weather conditions. All you need is a match to light it up and two pints of either white gas or unleaded petrol. Once the lantern is lit, you can dim the brightness using its adjustable knob. Coleman, however, recommend you use their Liquid Fuel to ensure your tank is free of gunk and debris. With 700 lumens, this camping lantern is indeed bright and cost-effective to boot. For every full tank, you can have a total of seven hours runtime even on high setting or you can double the hours if you run it low. 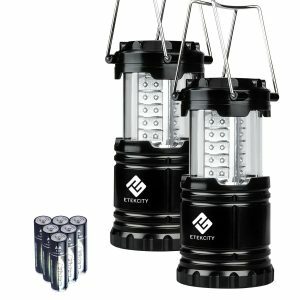 The Etekcity Two-Pack Portable LED Camping Lantern can light up an entire tent all by itself with its 30 LED bulbs. This little lantern is extremely powerful and energy-efficient to boot. It runs nothing more than three AA batteries but lasts up to 12 straight hours. One thing we like the most about this tiny lantern is its collapsible feature. You can leave it partially collapsed to reveal less light or pull it all up to reveal its brightest. 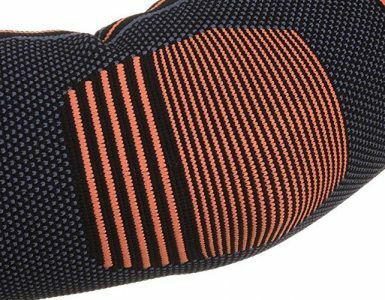 It has retractable handles too for easy placement and transport. Very compact and lightweight, even small children find this lantern so easy to carry. What is more, it features a military-grade plastic exterior so you won’t have to worry if it breaks once it slips from kid’s hands. 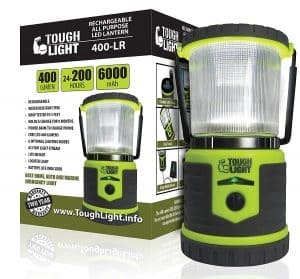 The Tough Light LED Rechargeable Lantern throws out a staggering 400 lumens and shines brightly up to 200 hours on low power. On high power, it can run up to 16 hours maximum. What makes this lantern even better is its 6000mAh lithium-ion battery that can be recharged using a universal USB charger. Rain or storm, the Tough Light remains rust and corrosion-free thanks to its water-resistant rubber seals and coating. Tough Light is also an effective emergency lantern. It features an SOS beacon that lasts up to 265 hours and a red light hazard that flashes up to 525 hours. That aside, you can recharge your smart devices using Tough Light so you can make those emergency calls whenever possible. With all these features, the Tough Light is surely tough to beat! Can charge smartphones, tablets, etc. 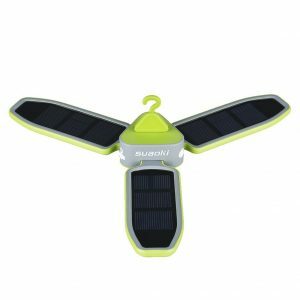 The Suaoki Collapsible Clover looks like a small ceiling fan at first glance but is actually a solar-powered camping lantern. Which, of course, you can use as a ceiling light considering it has a hook on top. Its thoughtful clover design provides an even brightness inside your tent. Each of its ‘leaf’ or solar panel can be adjusted according to your liking. If you fold all the panels flat, the Clover can function as a powerful flashlight. Moreover, the Suaoki Clover features three lighting modes. 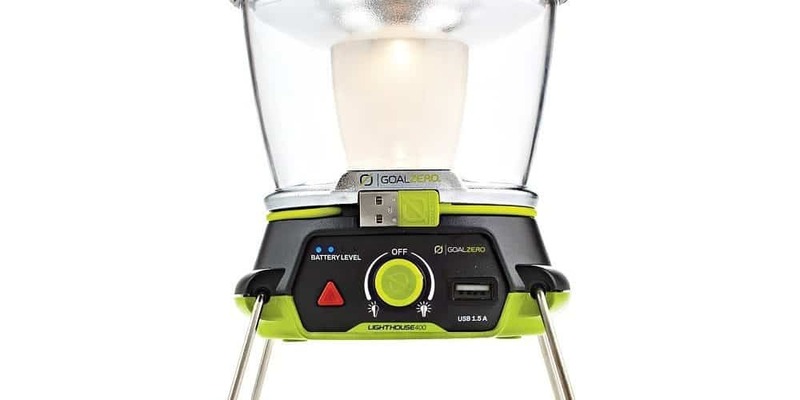 This camping lantern is equipped with 18 LEDs that you can juice up via solar energy. If the weather is rainy and gray, you have the option to charge your lantern using a standard USB charger. Battery-operated lanterns operate the most number of hours while solar-powered ones are indefinite. If you can adjust your lantern's settings, the better. Some camping lanterns include an energy saving mode or a nightlight setting to conserve more energy. But if you have grown tired of lanterns that burn out batteries, a rechargeable LED lantern is a good way to go. A camping lantern's lumen rating determines how the area illuminates. Hence, a lantern with a higher lumen rating has a wider coverage. Camping lanterns with 200 or 300 lumens are sufficient for lightening up a tent. For a much bigger campsite, you may opt for a lantern with 400 lumens or even more. 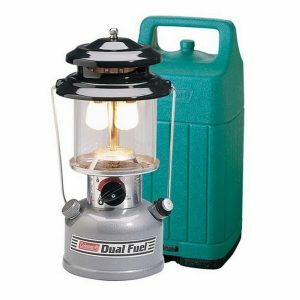 A camping lantern's weight is also a considerable factor since you have to transport it time and again. Rechargeable LED lanterns are more lightweight and portable. Even children can help carry such camping equipment. Most camping lanterns are easy to use such as battery-operated and rechargeable LED camping lanterns. Even kids can power them up in a jiffy. The best thing about modern lanterns nowadays is the fact that they don't emit plenty of heat. Solar camping lights and LED are great examples. They are safe around kids and will continue to illuminate your campsite even during a stormy weather. You don't have to deal with flames that could potentially start a fire or worry about the wind putting off the light. You'll never know when the next power outage takes place. If electricity is temporarily unavailable, a camping lantern can always light your home. If a lantern loses its power, you can recharge it using your vehicle's power port. Even if the moon and stars are smiling down on you, you need a camping lantern for better illumination. Camping lanterns provide a consistent source of light and are absolutely crucial during power failures that could last for a few days. As you can see, camping lanterns come in a wide range of power sources and styles. While some are lightweight and compact, there are others, which are heavy but excel more in power. 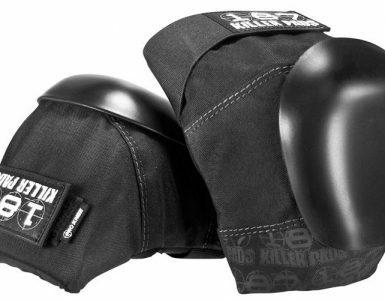 As for our top six, our favorite is the Coleman Quad Special Edition. We like how versatile it is, turning from one camping lantern into four flashlights. It is the perfect camping lantern for a family for or for a group who have folks who splinter off at night. Plus, it shines brightly at 190 lumens with 75 hours of total runtime. Reasonably priced, the Coleman Quad Special Edition is surely an offer you can’t refuse!